ARMIDALE AWARD WINNING B&B in an enchanting garden. FREE Cooked Breakfast incl. ARMIDALE B&B - winner of award of excellence in customer service - (as quoted by guests) "BEST BREAKFAST EVER", INCLUDED in the TARIFF. An unforgettable warm and friendly farmstyle Bed & Breakfast experience awaits you in this cosy atmosphere only 6km from historic Armidale. Nestled in an enchanting cottage garden with the friendly company of personality farm animals, the free-standing cottage allows guests to enjoy private ensuite accommodation. The historic cottage with its two bedrooms and ensuite, although not large, is well equipped with a selection of books, magazines and activities, and there are heaters in every room with good insulation and electric blankets on all the beds. Fans are provided for the warmer weather. Microwave, BBQ with crockery and cutlery are also available. Beautiful gourmet breakfasts enjoyed beneath the canopy of fruit trees, are a specialty and included in the tariff. Bread is home baked and preserves are lovingly made from fruit trees in the garden. Enjoy the company of the friendly farm animals; Sassy the new Border Collie pup who loves to welcome all guests, a personality filled cat, a cheeky miniature horse, ducks, geese and hens for the children to feed and collect the eggs. Option of delicious and intimate candlelit dinner with complimentary bottle of wine,or a short drive to town to dine at one of the many restaurants. Your hosts will help you with ideas according to your preference in places to choose for dinner. The chance to relax and enjoy country hospitality at its best - " warm, friendly and generous". Magnificent waterfalls nearby and bushwalking through Oxley Wild Rivers National Park. Poppy's Cottage is pet friendly, however please phone for requirements for your pets as there are some restrictions.Clean and well behaved dogs will be welcomed. Book for a night - book for a week - you will be welcomed and you will enjoy your experience at Poppy's Cottage! Armidale with its unique blend of culture, state of the art technology, educational diversity and natural beauty is a city offering everything worth living for. Situated in the country half way between Sydney and Brisbane and only two hours from the coast, it enjoys a warm summer, tones of amber during the autumn, a crisp winter and an exhilarating spring. Resting high on the Northern Tablelands, it is the most cosmopolitan NSW city outside Sydney catering for harmonious living for 24,000 citizens from 53 different nationalities. Armidale's educational facilities have attracted students, academics and their families from all over the world adding a multicultural dimension to the city and events hosted by different ethnic groups add vitality, spice and colour, making life in Armidale an enriching experience. Experience the natural beauty of spectacular waterfalls and vast Gorges in nearby World heritage listed national parks. Step back in time and see how the early pastoralists lived at Saumarez Homestead, a grand national trust home and also Booloomimbah at the University of New England. Less than two hours drive from Armidale along sealed roads is the spectacular gorge country of the New England National Park. Included in the World Heritage List, it offers views of magnificent unspoiled wilderness as far as the eye can see. Only 15 minutes drive from Poppy's Cottage, guests may stroll along the easy walks and enjoy the breathtaking panoramas of the Oxley Wild Rivers National Park and Dangars Gorge with waterfalls after the rain. They may view spectacular lookouts as well as exploring more testing treks. In the adjacent lane kangaroos may be seen grazing each morning and also may be seen living in the bushes of the extinct volcanic plug on the property. For the energetic; guests may climb the extinct volcano and stimulate a good appetite for their hearty Poppy's Cottage breakfast. You can then settle back under the fruit trees in an enchanting garden and enjoy the delicious meal served to you at your leisure. Spend the day relaxing in the shaded 2 acres of gardens or explore the town in the daily bus tour to hear the highlights of life in Armidale from its beginnings to the current time. There is information in the cottage for a self drive tour by car or a walk around the town to see some of the lovely old buildings and their attractive architecture. If you decide to stay longer your hosts will be happy to help you with information about the magnificent walks and sights of the local National Parks nearby. Warm and welcoming hosts who LOVE to share their home and lifestyle with you. Poppy's Cottage B&B has been offering bed and breakfast for over 27 years and has many happy customers returning to enjoy sharing the gardens, the farm, the lovely breakfasts and the very welcoming hosts. Armidale Poppy’s Cottage, Winner of Armidale Tourist award for excellence in Customer Service, is set on 140 acres only 10 minutes from the heart of historic Armidale. Enjoy cosy and warm accommodation in the “Settlers’ Cottage” adjoining the turn of the century homestead. The Cottage is set in about 2 acres of established, leafy, English style garden, interspersed with old-fashioned perennials and roses. With 2 bedrooms and ensuite, the cottage is totally private. Guests have the option of a delicious three-course dinner by candlelight, with complimentary bottle of wine. Wonderful breakfasts include a large selection of fresh and poached fruits, yoghurt, freshly squeezed orange juice as well as a full cooked breakfast. The bread is home baked and the jams are made from the fruit trees in the garden. Breakfast may be served during the warmer weather in the garden under the canopy of the fruit trees, and to the music of birdcall. Children may enjoy feeding the pet animals and collecting eggs from the hens. All the farm animals are very friendly. Coki, the cheeky miniature is loved by all. The new addition, a loving border collie pup Sassy, is charming the guests and owners alike. 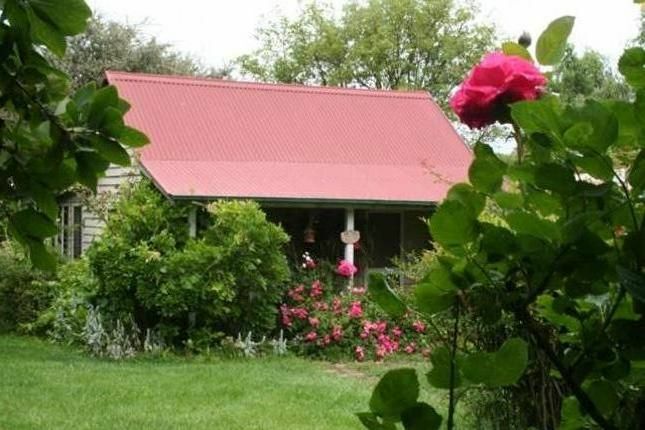 Poppy’s Cottage is the ideal base to experience Armidale’s culture, tourist attractions. Further along the road, visit world class National Park and spectacular waterfalls. (The walks in the park are stunning). Enjoy tasting wines from the adjacent winery or, during the weekend, sampling a delicious lunch in the gardens of the vineyard homestead. Safe undercover parking for your vehicle if you require this. Your hosts look forward to making you welcome. Your hosts have enjoyed offering welcoming bed and breakfast accommodation for over 27 years. A private bathroom on the side verandah is available for use with larger numbers, a family, or with the extra bedroom on the side of the house being occupied. The small miniature horse delights all the guests. Lovely cottage. Jack and Poppy wonderfully kind hosts. Tilly the Golden Retriever had the time of her life. She and Sassy will be friends for ever! Thank you for your kind review. It was a pleasure meeting you both and you were such easy guests to host. I do hope we have the opportunity to look after you both again one day. Happy New year to you and Maureen! Poppy and Jake are very kind, and they make a wonderful breakfast. The sky was littered with stars, the garden filled with flowers...and roses with such intense fragrance! What a treat to have Poppy’s Cottage available to us...a better way to stay and a very comfortable, memorable experience. Ooooh....and the breakfast made by Poppy and Jake was absolutely delicious- we felt very welcome and nurtured. What a treat. Thank you. Thank you Brigitte for your very kind review. It was so enjoyable having you and Cath here for your reunion and fun to share the joy with you both. I am so pleased that Poppy's Cottage was all that you had hoped for, and perhaps we may have the opportunity to offer this experience again for you one day. All the best to you both now that you have each returned to your families. I hope you were able to arrive home relaxed and refreshed after enjoying the peace in our blossoming garden. A relaxing experience with delightful people in unique surroundings! This is my second stay with Poppy and Jake. I can’t endorse it enough. This is a truely relaxing experience with some delightful people in unique surroundings. Breakfast is scrumdiddlyumptious! Served in uniquely Australian surroundings. The cottage is well stocked with tea, coffee and treats. There were plenty of books for reading and relaxing. We stayed for three nights on this occassion and left feeling completely relaxed and grounded. Thanks for a marvellous stay. We will be back again! We did so much enjoy having Peta back with us once more to stay in Poppy's Cottage. It's guests like this who make hosting bed and breakfast a sheer delight. Do come back soon! Just perfect, breakfast served in the garden #delicious #homemade EVERYTHING. perfect wonderful hosts. such a wonderful experience..